Last Empire War Z mobile game is an online strategy game for Android and iOS platforms. The game was developed by Long Tech Network Limited and belongs to the role-playing and the General game genres. The RPG involves the player shooting and battling the army of zombies in order to protect their empire. Alongside other players around the world, you can build an army and use your zombies to plan and execute an attack on the enemy zombies. The game also features human enemies apart from the zombies. Both have to be fought off by developing a kingdom of your own and befriending allies for combat. As the commander of the army, you aim to make your kingdom invincible. Last Empire War Z, the base-building game was released on December 4th, 2015. The game sets off with a tutorial by an assistant. When done with the tutorial, the following steps are pretty simple and the basic things are easy to grasp. The basis of the game is a task-oriented plan to come up with an empire to fight off other players. In general, the game has three types of missions that you can be involved in. These are; Empire Missions, Daily Missions, and Alliance Missions. In the Empire Missions, you are required to build, upgrade, and research the players own empire. With the Daily Missions, you really don’t have to complete them. You only click on the button in order to obtain a given resource and then wait for the mission refreshing. The most interesting and engaging mission is the Alliance missions. In this mission, you can make a choice of inviting other online players in real-time to help you in fighting against other empires. The missions that the alliance goes for is related to the alliance that you have formed. There are in-game purchases whereby you can buy resources. Alternatively, you can obtain some resources by watching in-game ads. Another interesting aspect of winning resources is by playing in a Casino slot machine. This makes it possible to randomly win resources. Apart from the zombies, players are engaged in fighting against other survivors. The zombie battles can be viewed by the player on the map of the world in real-time. You can also chat with the other members of your alliance on an online chat platform. Players are also to fight off the walking dead and be able to expand their empires. You can also recruit an army and officers possessing a skill-set and abilities that are unique. Last Empire War Z strategy game also allows you to use the latest technology to battle against the walking dead. The game features the ability of the player to recruit an army of zombies and train them accordingly to fight off other zombies. The game has Skill Trees where the player can use the varied skills available in coming up with an army in line with his/her fighting style. Alongside other online gamers, you can form alliances and fight together to defeat enemies and zombies in the battles. 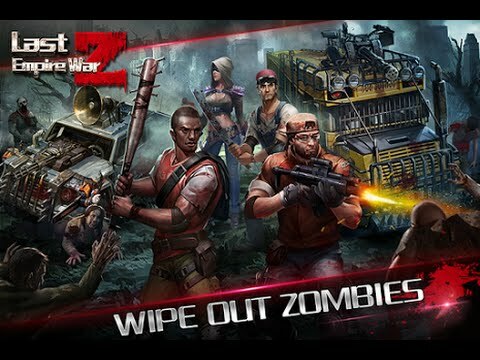 Last Empire War Z mobile game is most suited for those who love RPG games. The gameplay is addictive and this makes the game worth a try.